New Work Cities – Page 2 – Helping people build better collaborative communities everywhere! Take the guesswork out of building your coworking space. Save a lot of time, money, and headaches by building on our 11 years of experience building and helping hundreds of others develop collaborative spaces all around the world. 1. Should I start a space? Check out my article on how to start from scratch. Read my overview of some of the sustainable business models. Learn about how I can help you with your Coworking Launch Strategy. 2. How do I build a sustainable space? 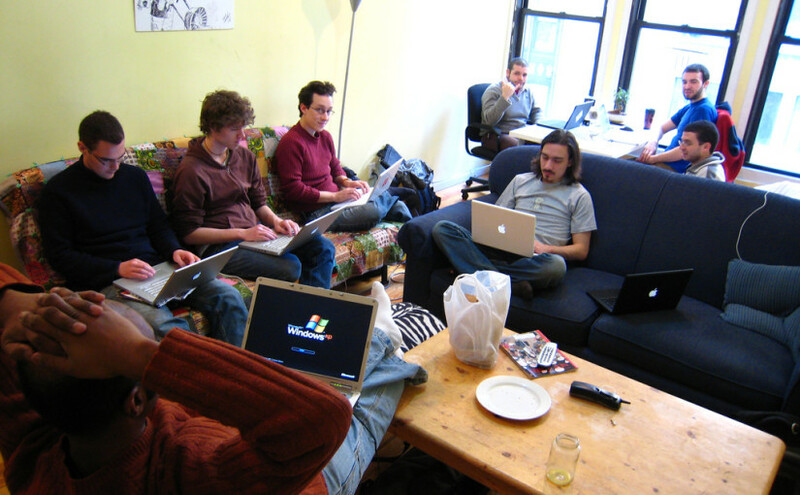 Have a look at the 7 proven coworking business models. Consider purchasing my Business Model Starter Kit! Learn how to avoid the Red Zone when you’re about to launch. 3. How do I get members? 4. How do run things more smoothly? Read our book, No More Sink Full of Mugs! Check out our Employee Manual Template. It all started in a Man­hattan loft. Work-from-home entrepreneurs (and damn nice guys) Amit Gupta and Luke Crawford realized that while they liked being able to work from anywhere, they missed the social experience of a traditional office. So they did something simple: every other Thursday, they invited anyone who was interested to join them for a day of casual work and fun among like-minded people. That simple idea was life-changing to a lot of people, especially me. I not only saw a chance to get out of my house and befriend some amazing people, I saw a chance to help lots of others make a badly needed transition to a new and better way of working. It turns out, I wasn’t alone. Lots of people were aching for a new way to connect in real life while learning how to work for themselves. So I found others who were looking for what I was looking for, and before I knew it we were building one of NYC’s first ever coworking spaces. Hi, I’m Tony. I’ve been obsessed with coworking since 2007. At the ripe young age of 23, I took a big chunk of my savings and trip to IKEA and, with the help of some amazing people, led the charge to open NYC’s first dedicated coworking space. We had an amazing run. We helped people build amazingly successful businesses, experimented with new kinkds of programs, hosted a ton of Meetups, and made life-long friendships. Along the way, I got active in the global coworking movement. I started speaking at conferences, contributing to online discussions, and eventually joining the board of Open Coworking to maintain community-built resources like the Coworking Visa. I also learned a lot about what it takes to run a successful coworking space… through a whole lot of ups and downs. You don’t need to go through the same trial-and-error that I did. I know how to help you answer the biggest questions that come up, how to anticipate the critical things that you might easily miss, and generally how to make the process of getting your space up and running as smooth as possible. Don’t waste time making mistakes that have been solved. Get in touch so I can help you!